... 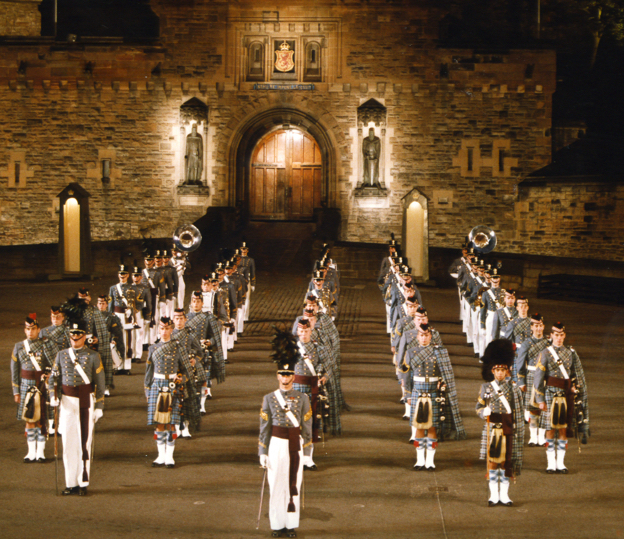 I went with a friend to the Edinburgh Tattoo. 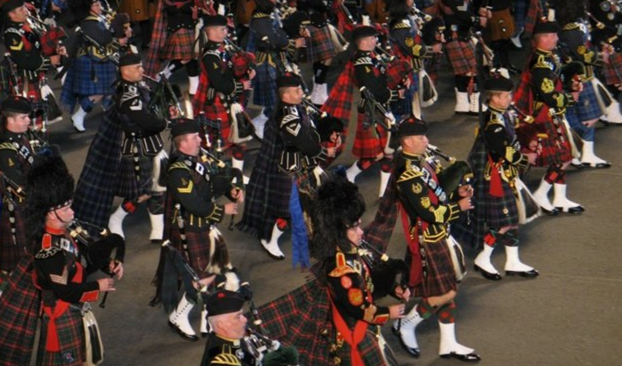 It's a wonderful, gigantic mass of Scottish pipes and drummers, with bands from around the world marching back and forth in formation, skirling the pipes and percussing the drums. As a former drum major and a Scot-ophile, I thought it was just wonderful! (Your opinion about bagpipes might vary from mine, but it was fantastic. Massed pipes and drums at the Edinburgh Tattoo. I sat through the performance with a knowledgeable friend from Edinburgh who was telling me about all of the units and brigades as they marched past. "That's the Black Watch...and this group is wearing the tartan of Clan Campbell..." He could tell me huge amounts of the history of each band just from the appearance of the plaid pattern of their kilts, the shape of their hats, and the particular badges they were wearing. It made me feel very much an outsider, I just didn't recognize anything. That is, until the Regimental Band and Pipes from the Citadel (a military college in South Carolina) came onto the field, dressed in Confederate gray uniforms (although I don't think the Confederacy had an official plaid pattern, nonetheless...). Suddenly, I knew a GREAT deal about the band that was parading before us--and our mentorship roles were reversed. When those uniforms marched past, I could tell my friend a lot about the history of the uniform, what the stripes on the arms meant, and what battles were fought--the entire history of Confederate military garb. That evening I realized how much history and knowledge is carried along in the dress, the badges, the hats, and the patterns that we wear. Hats are a very common sign of place and station in society. Here are three hats to identify. Can you figure them out? 1. Once upon a time, everyone wore hats. But in this famous movie, what kind of hat is being worn by the man on the far left? 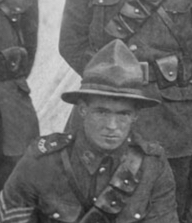 What's the name of that hat? And what kind of person would wear such a thing? 2. Hats vary a LOT from place to place. Can you figure out the name of this hat? Where would this hat wearer be from? Trust me, there's no lat/long information here, and the pineapple is just a distraction. 4. The pattern of plaid tells you a lot about the place where the wearer (or his military outfit) is from, and with it comes a whole lot of history. 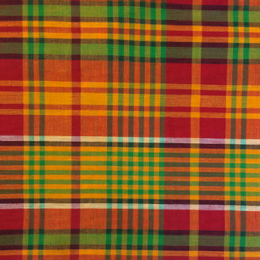 What region of the world is THIS kind of cloth from? As always, let us know HOW you found out the answers. It's okay to say FMOK--"From My Own Knowledge"--if you know, say so! But if you had to search for it (like I did! ), tell us how you did it. The Challenge this week was to find a lake somewhere in the world that had turned deadly. How deadly? And how was it deadly? 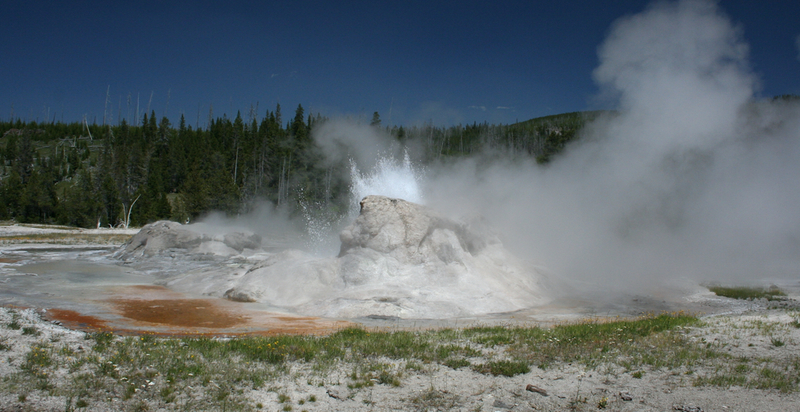 We were looking for a non-poisonous, non-boiling lake... That is, NOT like this one in Yellowstone National Park. A boiling lake WILL kill you either with temperature or poisons. But this isn't what we're searching for this week. 3. Given this kind of watery disaster, how high would the water go up into the sky from the event? 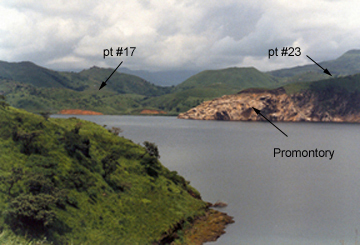 Lake Nyos (Google Maps link) is roughly circular maar in the Oku Volcanic Field. A maar is a crater formed when a lava flow interacts violently with groundwater, blowing a giant hole in the ground. The lake is thought to have formed in about 400 years ago and is pretty deep, (682 feet; 208 meters) sitting on a porous layer of rubble, full of leftovers from earlier volcanic eruptions. Carbon dioxide seeps up into the water from below transporting the gas upward and into the deep lake-bottom water. There, under pressure from the water above, the CO2 accumulates, with water pressure preventing the gas from bubbling up. Instead, it just dissolves into the water. In essence, this unusual configuration is creating very pressurized soda water. If the lake were in a different place, seasonal temperature swings would mix the waters, preventing carbon dioxide buildup. Cold weather causes surface waters to become dense and sink, displacing lower layers upward; in spring, the process reverses. But for equatorial lakes such as Nyos and nearby Lake Monoun, these deep layers seldom mix with top layers. These waters might be unmixed for hundreds of years. But on that night in 1986, something happened to suddenly cause the waters to mix, bringing the carbonated water from the bottom to the top. One theory is that boulders crashing into the lake set it off. (There were signs of a recent rockslide nearby.) Or it could have been a wind-generated wave that hit the surface just wrong, causing a mixing of the layers. As the bottom layers of water saturated with carbon dioxide started coming to the top, dissolved carbon dioxide bubbled out of solution, and the bubbles drew larger and larger until the lake exploded like a huge shaken seltzer bottle. This explosion also brought up iron-rich water, which oxidized at the surface and turned the lake red. which shows a number of great results. This search takes us to several more research reports, including ones that tell us about the wave. The Washington Post reported it as being 82 feet, but a report from the USGS claims that the resulting wave "washed over a promontory that is 80-meters in height..."
Lake Nyos shoreline that's been washed away by a large wave(s). And how high did the eruption blow water into the sky? Figure A from Zhang, Youxue. "Dynamics of C02-driven lake eruptions." Nature 379 (1996): 57-59. 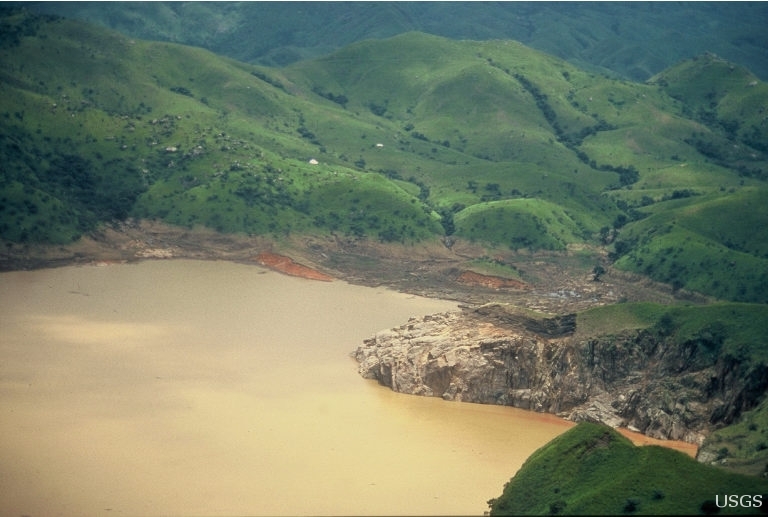 ... showing that the limnic eruption caused a shower of lake water roughly 300 meters into the air. (Note also that he's indicated a promontory height of 80 meters.) The water would have shot up from the surface at a top speed of around 199 mph (320 kph), which is incredibly violent. 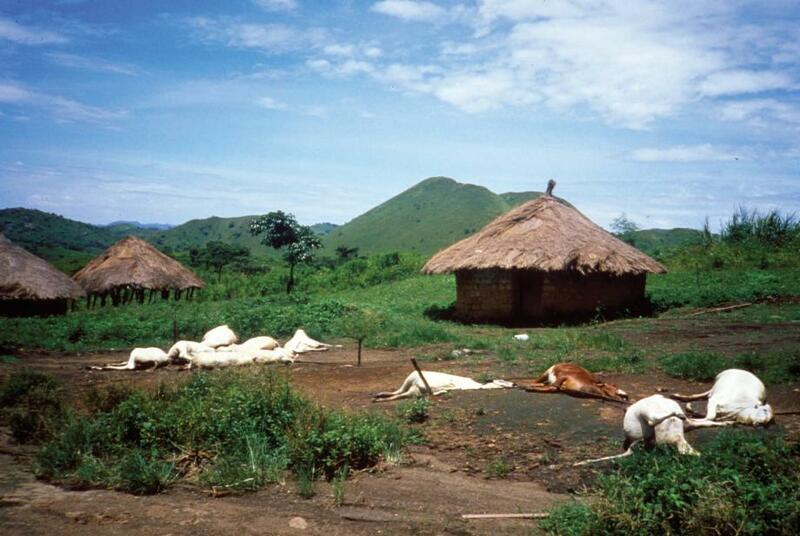 expanding gases as the water flows from 200 meters below to the surface of Lake Nyos. 2. 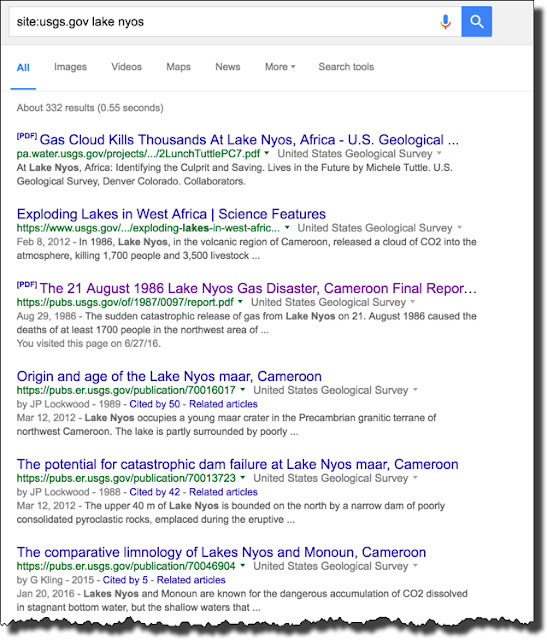 Checking a known expert site (e.g., USGS.gov) is a great strategy for getting in-depth articles. 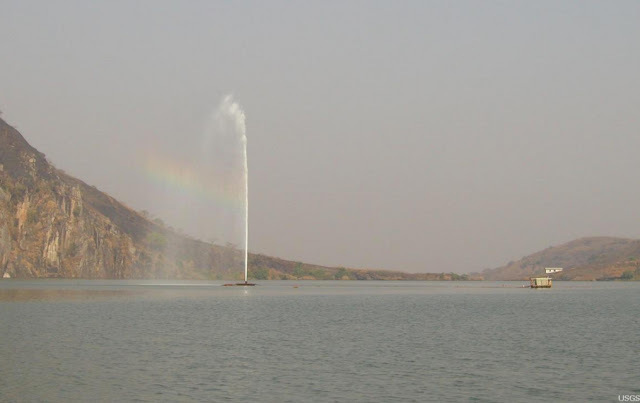 While it's easy to find lots of articles on Lake Nyos, scholarly articles are best when they come from a known source that does a lot of work in this area. 3. Specialized terms, when you learn them, are great! This is a lesson we've seen a bunch--when you see these special terms (or phrases, such as limnic eruption), use them! 4. Triangulating multiple sources is a requirement. As you see, there are reports of the tsunami being 80 feet... or 80 meters. That's a huge difference. When you're doing research like this, keep looking around--you might find very different data (or points-of-view) around a topic, even things that should be easy to verify. Take care, if you find yourself next to a temperate, carbonated lake that hasn't turned over recently! I know what you're thinking--how strange can a lake be? A lake's a lake, right? In this case, the lake I'm thinking of seems not just strange, but deadly. The lake I've been reading about directly caused the death of a lot of people. They didn't drown, and it wasn't due to something obvious (like a dam bursting, or an earthquake), but was something intrinsic to the lake itself. 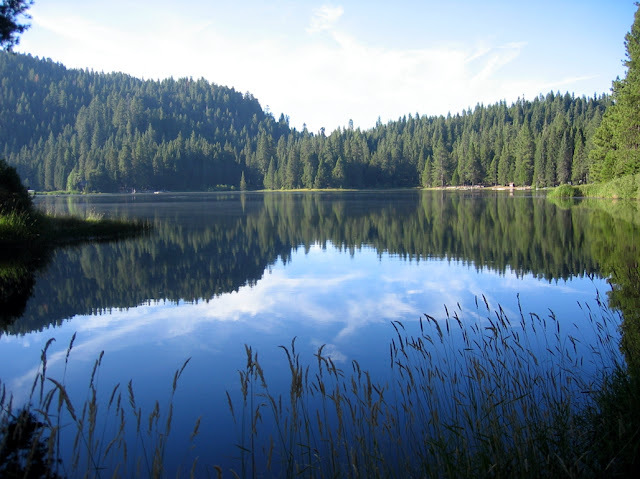 A generic lake, quiet, serene, and probably not very dangerous lake. It's not a poisonous lake (that is, you can go swimming in it without any harm coming to you), and it's not a boiling lake, like this one in Yellowstone National Park. Falling into this is a bad idea. On the other hand, a boiling lake WILL kill you either with temperature or poisons. Answer: What was that word again? Effective searching with old terms. ... the language of the past is somewhat different than the one we speak (and write) now. As a consequence, when you're trying to search for historical content, you sometimes (often?) have to shift your language to accommodate the way authors in the past would have written. 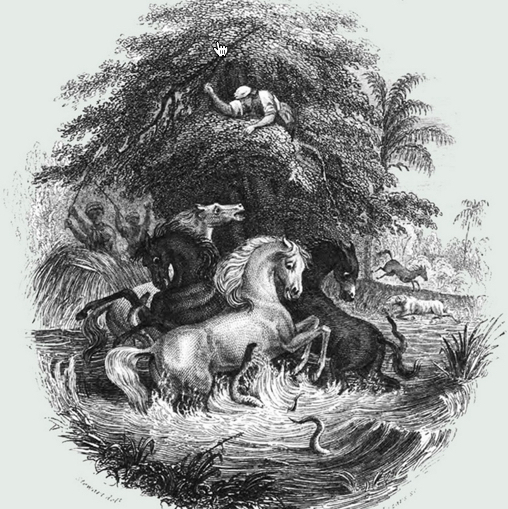 The motivating example was the long-known, well-loved brontosaurus. When I was a kid, that was the dinosaur of choice (unless you were a T-Rex fan). But, a finer distinction was made between the brontosaurus and the apatosaurus. The named, un-named, and restored (with a different skull) brontosaurus. And, more generally, can you come up with a general way to help answer questions like this? The interest level in these questions were pretty high--we had lots of comments. 1. 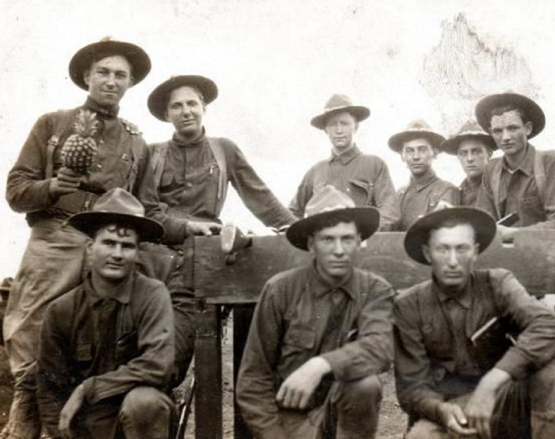 While reading about the US Civil War, I had read in one source that many of the soldiers died from some kind of disease that had extensive diarrhea. Yet, when I search in writings from that time, I find lots of diarrhea, but I seem to be missing many of the references. What other term(s) SHOULD I be using to search in archival accounts from that period for this disease? There are several ways to find terms for medical conditions used during the US Civil War (1861 - 1865). Here are a couple of methods. will give us a bunch more synonyms (Delhi belly, flux, Montezuma's revenge, runs, trots, turista), but for each of these you have to check to be sure they're Civil War period relevant. Looking at the Ngram chart for "Delhi Belly" shows that it didn't come into use until the late 1940s. leads us straight to a dictionary of Civil War slang (a different source than the one above), and confirmation that "flux" and "quick step" were synonyms. which leads us quickly to The Language of the Civil War (John Wright, 2001), confirming "flux" and "bloody flux." 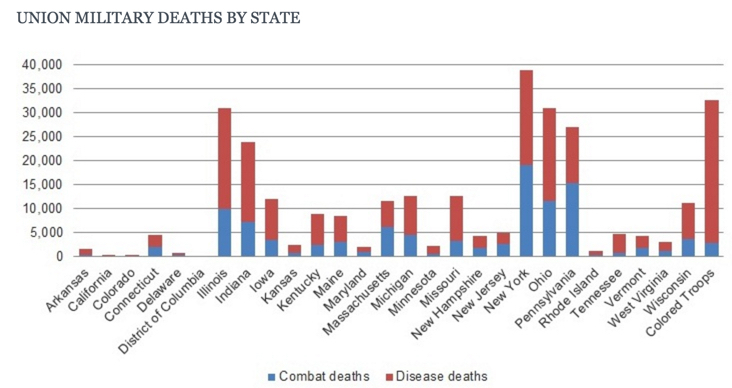 As you can see, MOST of the deaths during the American Civil War were due to disease--there were many terms, but any diarrheal problem was often called flux, quickstep, or trots. Those (along with regular old diarrhea, in all of its misspellings) are the search terms to use. 2. These days, it's popular to go to a spa that features natural hot springs, such as those at Wiesbaden (Germany) or Bath (UK). 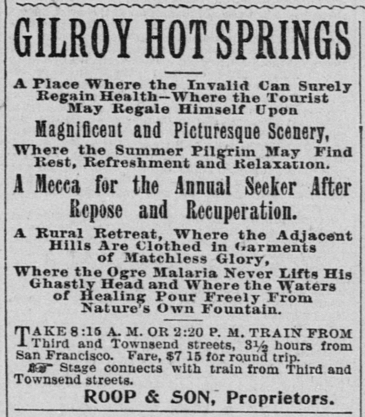 But if I'm searching for such a spa to visit in 1890's America, what search terms should I use? Again, the problem here is to find terms that were used during this time to describe a spa with hot springs. While SRS readers made many great suggestions: (Ramon) "Hot/cold springs," "Balnea," “Thermal waters," "taking the waters" -- (R) "mineral springs," "wash-houses" -- (Sarah) "Mineral springs." As we did above, you can get started by doing standard synonym queries and poking around at Wikipedia articles, looking for alternative phrases. Then, once there, I limited the dates of my search to 1890 - 1899, and searched for "Saratoga Springs" (a place that I already knew as a famous natural spring resort). My idea was to search for newspaper accounts of the place, and see how the articles referred to it. All of the red boxes are hits for the string "Saratoga Springs." sanitarium, tonic spring, sulphur springs, soda springs, and very commonly hot springs. I'm sure if I kept reading, I'd find other ways to refer to these kinds of therapeutic resorts-with-springs. But this is a great list, and it comes directly from the writing of the times. Ad for Gilroy Hot Springs, California. 3. While reading about optics and the life of John Dollond (the inventor of the achromatic lens, for which you should be grateful), I learned that he died of a stroke. But I can't find period accounts with that search term. 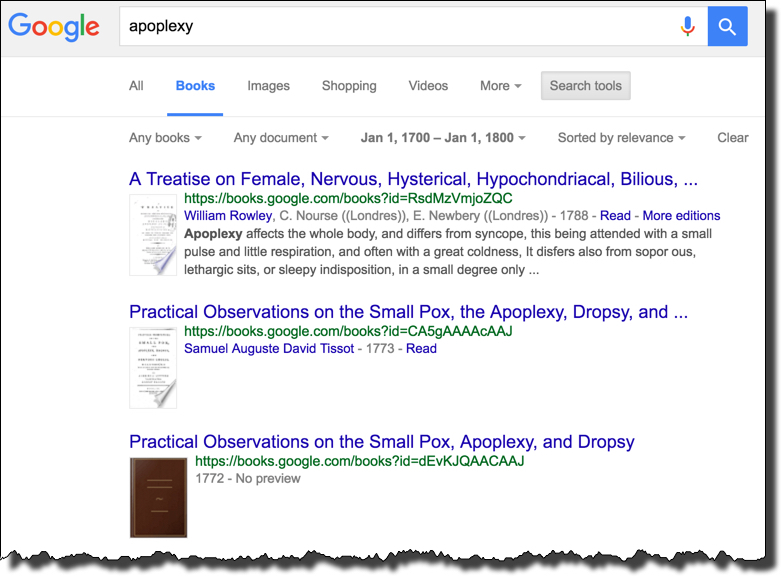 What search term should I use instead to find an 18th century death by stroke? Now we know that searching directly for synonyms can often give us lots of options, but then we need to verify that the term was used during that time period. confirmed that it means a "stroke." How do we confirm that this was using in the 1700's? 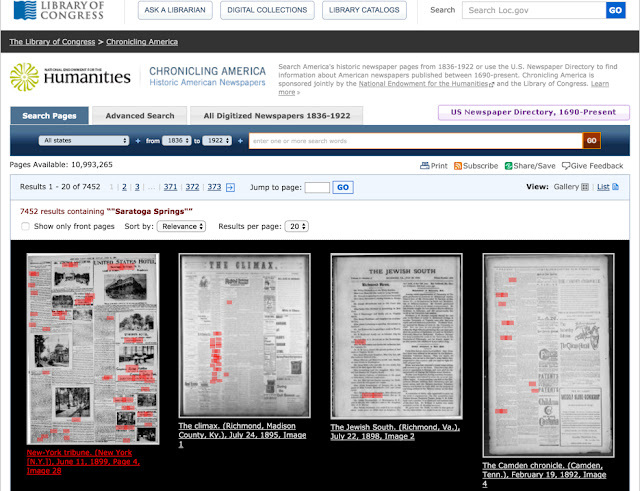 The NGRAMs database only goes back to 1800, and many of the newspaper archives are limited to post 1800 as well. 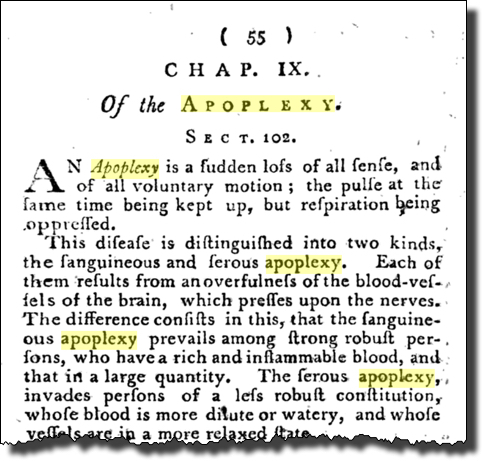 I scanned down a bit to find a book that has a readable (to my modern eyes) explanation of apoplexy, and found it in the book: Advice to people in general, with respect to their health. Translated from the French ... To which are added, by the author, two new chapters; one upon inoculation, the other upon lingering distempers ... The sixth edition, corrected and improved (by Samuel Auguste David Tissot, 1793). an "f" is in fact a "long-S." Thus, "fudden" is "sudden." I like the image here (of "inflammable blood, and that in a large quantity.."). But you get the idea. Apoplexy is the word we seek. 1. Search for synonyms.. but check that the synonyms you find are time-period appropriate. As we saw, the obvious search for synonyms will often offer up old-fashioned and even archaic terms for a idea you seek. But you have to check that this term is the right one for the time. 3. A great way to find old terminology is to check-out old newspapers and books. The simplest way to do this is via online archival newspapers (e.g., those at the Library of Congress) or in a books database (Books.Google.com) that has a collection from the deep past. ...those who know how to use information resources and those who don’t. Students who knew the ways to leverage a library for research could consistently do better research than those who couldn’t. That's not a surprise. But this gap is turning into a vast chasm of difference. Students who know how to use online resources efficiently and effectively will be able to massively outperform students who don’t. This is a qualitative change from the days of paper-based libraries and information resources. Then, doing research was largely limited to what you could reach out and touch by hand. 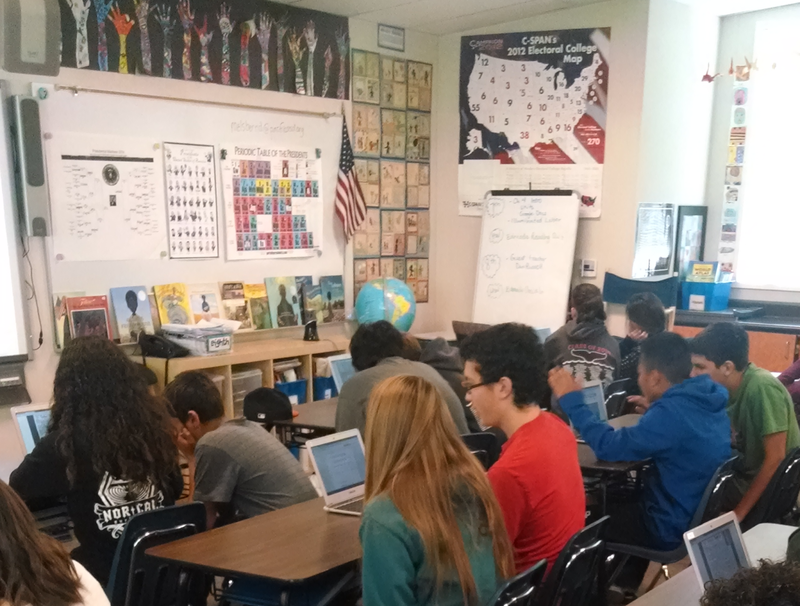 Now, it’s possible for students to do research on information that scattered across the entire planet; and they’re not limited just to finding text in documents, but can find original archival images, movies, code fragments, transcripts of trials, books, magazines, and sounds. Here’s my favorite example of this change. In the 1990s I used to teach AI algorithms to my graduate students in Computer Science as a way to help them understand the inner workings of Artificial Intelligence. If you can write a program to do some task better than a human can do it, then you’re well on the way to understanding how this algorithm operates and in the process, you’d learn something about the nature of intelligence. I taught this class this for over 10 years—handing out the assignment one week, and then expect the homework to be done three or four weeks later after we’d covered the material, discussed how things worked, and let them write, debug, and explore the code. And then, in the early 2000’s, I noticed that my students were suddenly turning in their assignments weeks ahead of schedule. What? Weeks ahead of the syllabus? That didn’t seem possible, until I asked around and found that they were just Googling for the code, finding that someone else had written it already, modifying it slightly, and then turning it in as their solution. This was the leading edge of a huge shift in the way people program, and more importantly, in the way students did their work. That was a few years ago, but it set the stage for what’s happening now. It was never great educational philosophy to just shovel facts to a student and then ask them to pick the right one from the set of options, but now, with search engines and a galaxy of online content available in milliseconds, it’s a truly terrible idea. Students who are good researchers can find information on a topic faster than you can push it to them. This is as true in the elementary grades as it is in graduate school. We all know sixth graders who can (with the aid of their phone and a quick search) name all of the signers of the Constitution in less than 10 seconds. Suddenly, what it means to know something has profoundly changed. There’s a difference between knowing, and knowing how-to-search. There’s a difference between knowing that something exists, being able to find it rapidly with a moment’s worth of research, and then being able to pull together multiple sources of information into a coherent analysis. In particular, the research skills gap is growing. Students (and teachers, and for that matter, employees) who are able to do rapid and accurate research on a topic have a substantial advantage in getting things done and deepening their understanding. What’s more, there’s an unexpected second-order effect: those that have developed and sharpened their research skills can grow those research skills over time, increasingly widening the gap from their peers who haven’t mastered that self-teaching nuance. Having research skills isn’t just an optional part of your education—they’re essential. Especially once you know how to do the research to upgrade your research skills. It’s important to realize that there is a fundamental change going on in what it means to learn. We know that memorizing the US presidents in election order isn’t really a useful skill for most students. It’s rare that anytime after high school that you’ll be asked if Chester Arthur was before, or after, James Garfield. But if you don’t know the names of the presidents, if you have never studied them as a group, in a sequence, possibly with their party affiliations, then you probably won’t recognize the name of Millard Fillmore as a Whig president, but perhaps only as the name of a trivia hunt game. The very nature of what it means to know is shifting our understanding of teaching, and what’s important for our students to command. Students still need to know about presidents, their policies, and the role they play in the history of the nation. 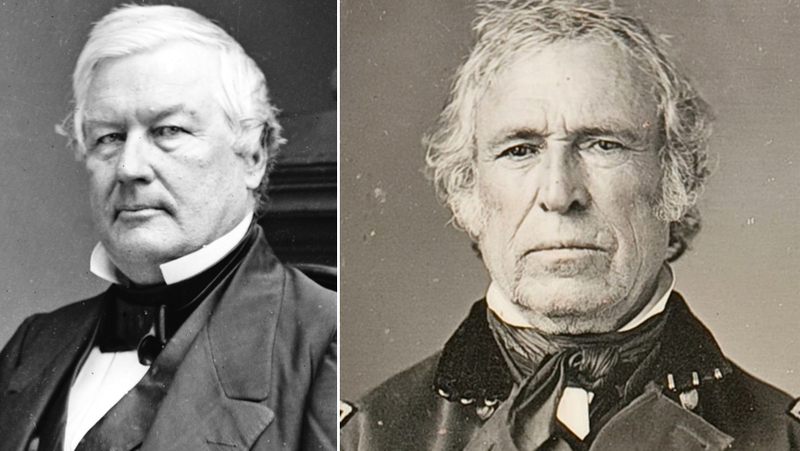 Do you know who Millard Fillmore and Zachary Taylor are? Or, why it matters that you do? Be curious, my friends. For example, Fillmore wasn’t elected president, but assumed the presidency when Zachary Taylor died in office. His attitudes about slavery influenced the course of the Civil War. Students still need to know these kinds of things, and is possible that learning the sequence of presidential elections is a good way to introduce those ideas. But even more, they need to know how to find out more about a topic in a way that is efficient and accurate. They need to command the key topic ideas, recognize the presidents, their policies, and their parties. They need to cultivate the trait of curiosity that will let them keep reading beyond Millard Fillmore, and learn about Zachary Taylor, and why Taylor setup Fillmore, and why that affected the US Civil War. Most importantly, they need to be able to answer the entire range of questions that will come up... and for the most part, that will require the skills of SearchResearch skills, and a drive to be curious about the world. ... is that the language they spoke then is different than what we speak (or write, or blog). For instance, when I was young, I grew up learning about a dinosaur called the brontosaurus. The way these things go, the name was more-or-less rescinded, and then brought back a few years later when a newer, finer distinction was made between the brontosaurus and the apatosaurus. If you're curious, you can go read that article to hear the whole story about the name changes (and why they keep changing the name back and forth-it's an interesting story). But the reason I bring it up here is that terms can change significantly over time. I've written about this before (Search for terms from long ago), and we're revisiting this idea with a couple of new Challenges. In the earlier post I gave a bunch of examples of terms that have shifted with time: Boers -> Afrikaners; insane -> mentally ill; outdoor relief -> public welfare; etc. This terminological shift (a great phrase to use at your next party!) showed up a bit in my own research recently. Can you figure out how to answer these Challenges? This can be a little tricky... so when you give us your answer, be sure to tell us HOW you determined what the time-period appropriate term(s) should be! Did you just know off the top of your head, or what resources did you use to get this insider information? 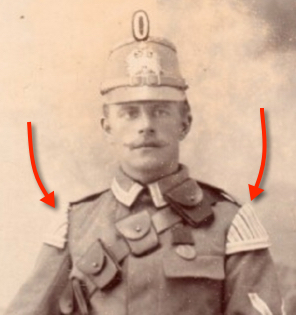 One of the true pleasures of life in the Age of the Internet is our historically unparalled ability to notice something interesting out there, and then using your SearchResearch skills to figure what's the backstory to this interesting thing you noticed. While I've always noticed the unusual, the strange, the bizzare, and the unexpected, NOW you can do the background research fairly quickly. This week had more than the average number of TILTs. An electric eel at rest, not leaping. But it could. 1. What other kinds of fish leap from the water to attack their prey? that have been herded into their shallow water pools. Notice that if you try a couple of variations on this search, you'll get somewhat different results each time. (The better with which to scan the universe of possibilities.) Try alternates such as [ fish jumping out of water ] [ fish jumping to attack prey ] and so on. As I read, I also learned about the arowana which can leap up to 2 meters out of the water to capture small prey (video of an arowana catching a spider, see: 3:11). There are reports of sharks leaping out of the water, but as far as I can tell, they're not doing that to attack prey that's not in the water, but are attacking prey on the surface (such as a seal), and then driving up into the air as part of their follow-through. But, much to my surprise, there are a number of fish that leave the water to attack their prey. Who knew? (although others work as well). I decided to search for "historic" rather than "unusual" or "weird" because I didn't want to find lots of strange x-rays, but I wanted to focus on the uses of X-rays, and since most of the recent uses are primarily vetted (and mostly not odd), I figured that the historic perspective would be useful. a. Xrays for shoe fitting: Yes, X-rays were once use to see if your shoes fit. 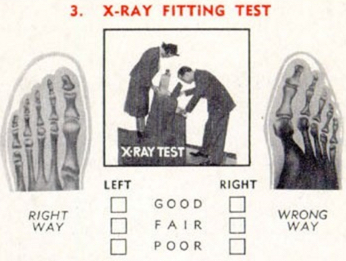 Sounds great (and if you don't know that X-rays are potentially harmful, it would seem to make sense)! 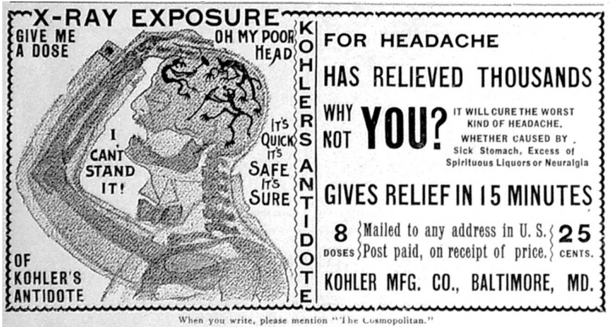 Kohler's Antidote... "X-ray exposure" pills. Ad from Cosmopolitan magazine, 1897.
c. Hair removal: Since one of the side-effects of x-ray treatment is that your hair falls out. This led to a real growth industry in using x-rays to cause focal hair removal. 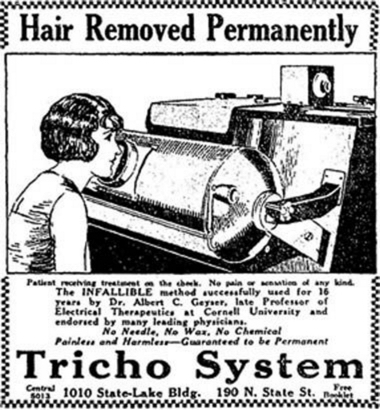 By 1924 the "Tricho System Sales Corporation" came into being (see their ad below). 3. I saw a concert at a church with this on the ceiling. What's the name of the church where the concert was held? A quick scan of the SERP tells me that this is a depiction of "Our Lady of Sorrows," a carving of the Seven Sorrows of Mary, each of the swords (or daggers) stands for one of the sorrows she experienced. But WRT the name of the church, there are many Catholic churches named for "Our Lady of Sorrows," but if you look at the Wikipedia page, you'll see (near the end) "Mission San Francisco de Asís in San Francisco, California, known also as Mission Dolores." 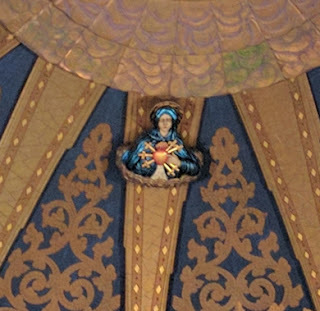 But (and I didn't realize this would work until after I'd written the blog post), an Image search shows a link to the wood carving sculptures of Samuel Berger, which shows definitively that this particular carving of Mary was done by Berger, and placed in the Mission Dolores. 1. Don't forget about reverse image search. Since I took that photo of Mary late at night and under not-exactly-optimum conditions, I didn't think image search would work... but I was totally wrong. (I only tried it later, and discovered the wonderful carving of Samuel Berger.) But don't forget to try it! 2. Don't forget about image search for complex concepts. Although I solved the X-Ray problem by using ordinary search, I later discovered that doing those searches and then checking out the Images results often would lead me to some other kinds of fascinating results. 3. When trying to get a broad overview of a topic, consider doing multiple DIFFERENT versions of your query. As I found, three or four different versions of a query will often give very different search results. If you're trying to get a broadbrush overview, this is often a great method to get good coverage. 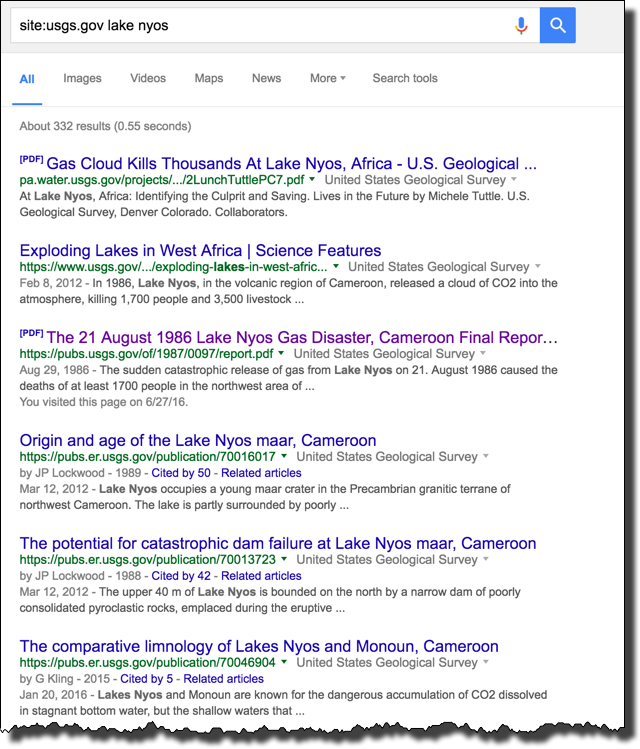 Search Challenge (6/8/16): Looking up TILTs?